If you turn blind at 17 you start seeing the world in a different light! When Hassan Sheheryar Yasin lost his sight in a car crash barely in his teens, he was more resolved than ever to see the world the way he wanted to. This is the story of the boy who grew up in a single parent household and beat the odds to become one of the most recognizable names in Pakistan fashion today. To be honest, I didn’t quite know what to expect of our meeting with Hassan Sheheryar Yasin. As Foha and I waited for him to join us and start the interview, I thought he would be impatient and hassled, it was after all just a few days before the fashion week was to kick off and we were trying to catch him at the day end when he was probably exhausted. The ball of energy that walked into the room five minutes later, flu-ed out but grinning ear to ear was the last thing I expected and the conversation that left us in awe of this man started. Growing up in a single parent household isn’t easy, and Shayroo (as he is referred to by his friends) decided very early on to never be a wallflower. His near fatal accident made him more resolved than ever to life his life to the fullest… It marked his metamorphosis from a boy afraid to admit he loved fashion to the man who eventually made it in every possible avenue associated with the industry. His journey started with an audition he now fondly looks back at. ‘I auditioned to be a model after my accident but with scars all over my face, I was rejected. It was the same show in 1994 that I then approached one of the showcasing designers, Nilofur Shahid, and told her I wanted to choreograph her show. I shared some ideas with her and she took a chance on me. I got a great review for the show in The News, even the fact that they called me Hassan Jahangir didn’t take away from the excitement I felt’. Hassan is always quick to credit his mother whenever speaking of his achievements, she was the one who encouraged him to get ‘training’ as a designer. She was an educationist herself and always emphasized on the importance of education. ‘I don’t mean this as disrespect, you may have great aesthetics but unless you don’t train yourself you won’t become great. Not all heart surgeons are great, they work hard to be good at what they do and training plays a great part, why should it be different for fashion or anything else’. Graduating from PSFD, Hassan Sheheryar Yasin started his label with 2500 rupees in his pocket. He bought a rocket ‘silai machine’ a mattress and gave his tailor an IOU. With no money in hand for fabric even, his first pieces were designed using bed sheets… Once ready, he partnered with Ather Shahzad for his shoot and dressed a newcomer then known as Mona Ali. His first editorial appeared in SHE Magazine and the model eventually became known to the world as one and only Iman Ali. Hassan was lucky to get his first few clients almost immediately after this editorial, some of the more renowned names included Babara Sharif and Tahira Syed. Looking back at that time Hassan Sheheryar Yasin recalls ‘It was an interesting time, some of the most recognized names in the fashion industry were just starting out then. The power duo Ather Shahzad, Vinnie, Aaminah Haq, Iman Ali, ZQ, Alliya Zaidi… they’re all like my family’. Like most of the names Hassan took, he never looked back. Since the brands’ inception, HSY is the only label to have participated in all the PFDC organized shows in addition to a list of shows locally and internationally. Not only has he firmly established his position as the couture king of the country, Hassan has also ventured into Pret a Porter recently. When asked what took him so long, he gave a simple answer, ‘I didn’t feel like it before and when I finally felt that it was time, I did it’ . If one is to take his word, it is obvious by all that he has done in life so far that he indeed follows his heart to where ever it takes him whether it is hosting his TV shows, DJ-ing, directing fashion shows, mentoring, travelling or just simply designing. At the end of the day, whatever Hassan may be to the world, his heart belongs to his family. He has spoken of the love and admiration that he has for his mother at every forum he’s got a chance to… ‘ I’m nothing without her’ he says speaking of his mother, ‘In a world where people weigh you down with expectations and tell you what or who you should be, she just let’s me be me. My sister on the other hand keeps me grounded… I love the fact that she adds a perspective to my life, I love knowing that I still need to learn more’. Hassan also feels very patriotic and tries giving back in whatever ways he can, whether it is by supporting charities and causes or simply being a positive ambassador for the country through his work. Often mistaken for being Middle Eastern when travelling Hassan Sheheryar Yasin loves telling people he’s Pakistani. ‘I know that anything that I am today is because of where I am, I would not have had this opportunity had I been anywhere in the world, this country has given me an identity’. 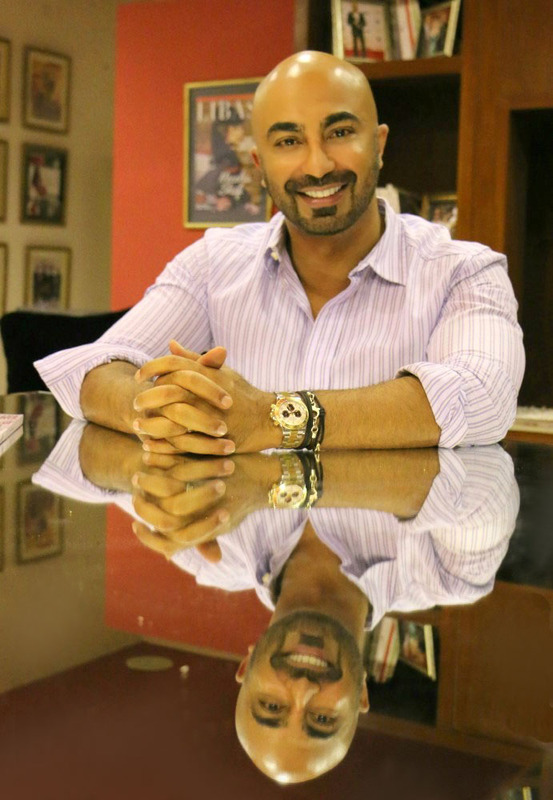 Finally when our chat with Hassan Sheheryar Yasin was drawing to an end after a good hour more than we had anticipated seeing him for, we asked him to just sum it all up…. I live my life so my tomb stone can read: ‘Here lies the man who lived’.